Own Transformers 1 To 3 Blu-Ray from Deff, DVD, Blu-Ray & 4K Video Specialists - Free UK Delivery..
Own Transformers 1-2 Movie Collection (2 Films) DVD from Deff, DVD, Blu-Ray & 4K Video Specialists - Free UK Delivery..
Own Transformers 1-3 Movie Collection (3 Films) DVD from Deff, DVD, Blu-Ray & 4K Video Specialists - Free UK Delivery..
Transformers: From director Michael Bay and executive producer Steven Spielberg comes a thrilling battle between the Autobots and the Decepticons. When their epic struggle comes to Earth, all that stands between the evil Decepticons and ultimate power is a clue held by Sam Witwicky (Shia LaBeouf). Join the fight for mankind in the extraordinary adventure that "is this summer's coolest film" (FHM). 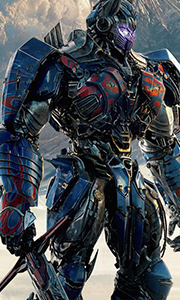 Transformers 2: Revenge Of The Fallen: ..
Transformers 4 - Age Of Extinction: From director Michael Bay and executive producer Steven Spielberg comes the "hugely entertaining" Transformers: Age Of Extinction. With humanity facing extinction from a terrifying new threat, it's up to Optimus Prime and the Autobots to save the world. But now that the government has turned against them, they'll need a new team of allies, including inventor Cade Yeager (Mark Wahlberg) and the fearsom..
Own Transformers 1-4 Transformers / Revenge Of The Fallen / Dark Of The Moon / Age Of Extinction DVD from Deff, DVD, Blu-Ray & 4K Video Specialists - Free UK Delivery..
Transformers 5 - The Last Knight, Transformers 4 - Age Of Extinction, Transformers 3 - Dark Of The Moon, Transformers 2 - Revenge Of The Fallen, Transformers..
Own Transformers 1-5 Movie Collection (5 Films) DVD from Deff, DVD, Blu-Ray & 4K Video Specialists - Free UK Delivery.. The battle for Earth continues in this action-packed blockbuster from director Michael Bay and executive producer Steven Spielberg. When college-bound Sam Witwicky (Shia LaBeouf) learns the truth about the ancient origins of the Transformers he must accept his destiny and join Optimus Prime and Bumblebee in their epic battle against the Decepticons who have returned stronger than ever with a plan to destroy our world.Special Features ..
A mysterious event from Earth’s past threatens to ignite a war so big that the Transformers alone will not be able to save the planet. Sam Witwicky (Shia LaBeouf) and the Autobots must fight against the darkness to defend our world from the Decepticons all-consuming evil in the smash hit from director Michael Bay and executive producer Steven Spielberg.Special Features Above And Beyond: Exploring Dark Of The Moon, Uncharted Territory:..
From director Michael Bay and executive producer Steven Spielberg comes the 'hugely entertaining' (Sunday Mirror) Transformers: Age of Extinction. With humanity facing extinction from a terrifying new threat, it's up to Optimus Prime and the Autobots to save the world. But now that the government has turned against them, they'll need a new team of allies, including inventor Cade Yeager (Mark Wahlberg) and the fearsome Dinobots!Special..
From director Michael Bay and executive producer Steven Spielberg comes the "hugely entertaining" Transformers Age Of Extinction. With humanity facing extinction from a terrifying new threat, it's up to Optimus Prime and the Autobots to save the world. But now that the government has turned against them, they'll need a new team of allies, including inventor Cade Yeager (Mark Wahlberg) and the fearsome Dinobots!Special Features Evoluti..
Own Transformers 4 - Age Of Extinction DVD from Deff, DVD, Blu-Ray & 4K Video Specialists - Free UK Delivery..
From Director Michael Bay and Executive Producer Steven Spielberg comes "the best Transformers yet." Our world's greatest hero becomes our fiercest enemy when Optimus Prime launches a mission to save Cybertron by destroying Earth. Now Bumblebee and Cade Yeager (Mark Wahlberg) must lead the Autobots against their former ally in the ultimate battle to save mankind from annihilation.Special Features Blu-Ray Feature Film, Blu-Ray Special..
Own Transformers 5 - The Last Knight DVD from Deff, DVD, Blu-Ray & 4K Video Specialists - Free UK Delivery..
From director Michael Bay and executive producer Steven Spielberg comes a thrilling battle between the Autobots and the Decepticons. When their epic struggle comes to earth, all that stands between the evil Decepticons and ultimate power is a clue held by Sam Witwicky (Shia Labeouf). Join the fight for mankind in the extraordinary adventure that “features some of the most spectacular action and effects sequences of any movie of its kind..
From director Michael Bay and executive producer Steven Spielberg comes a thrilling battle between the Autobots and the Decepticons. When their epic struggle comes to earth, all that stands between the evil Decepticons and ultimate power is a clue held by Sam Witwicky (Shia Labeouf). Join the fight for mankind in the extraordinary adventure that “is this summer's coolest film” - FHM.Special Features Commentary By Director Michael Bay,..
Own Transformers DVD from Deff, DVD, Blu-Ray & 4K Video Specialists - Free UK Delivery..
Own Transformers 1-4 DVD from Deff, DVD, Blu-Ray & 4K Video Specialists - Free UK Delivery..
Own Transformers 5 - The Last Knight 2D / 3D Blu-Ray from Deff, DVD, Blu-Ray & 4K Video Specialists - Free UK Delivery..